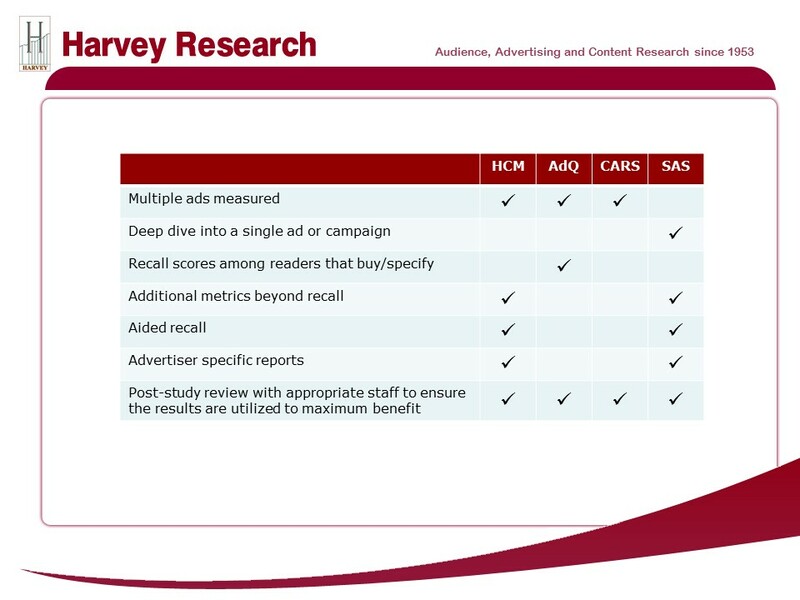 Ad Studies Comparison Chart - Harvey Research, Inc.Harvey Research, Inc.
Harvey Research’s Advertising Readership Studies offer a wide variety of features, options, methodologies and pricing to provide you with the solutions you need to meet your objectives. Below is our Ad Studies Comparison Chart that details many of the features of our primary ad studies. In addition to advertising readership studies, we offer a wide variety of customized audience research studies. Please contact us with any questions you might have about our AdQ, HCM, CARS or SAS programs or if you’d like additional information.